Scenery files updated to remove unnecessary lines and pal files. Some also updated to be exhibit and/or waterplaceable. Some have had minor rotations alterations. The ghost was changed by fern to remove unused files from the ".ztd", to remove unnecessary lines from its configuration, to show the foliage tooltip for the female and young, and to fix the configuration to refer only to the graphic names that had been created for it. The ghost was also changed by Jay to have it like the various Shelters For All Animals as much as any other shelter. 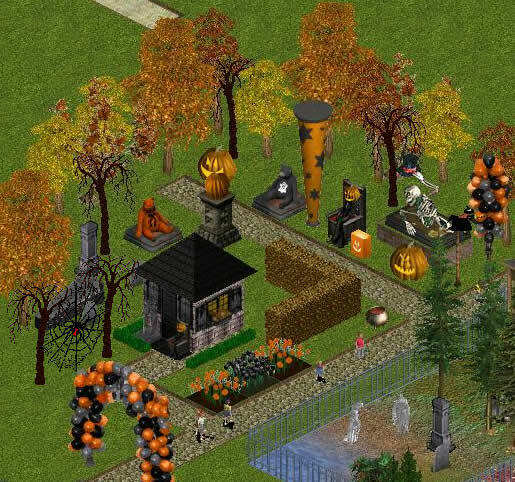 Description: This pack contains 27 Halloween themed items. Fall foliage, giant spider web, skeleton statue, coffin, pumpkins and more. There's also a spooky restaurant and a Ghost animal.